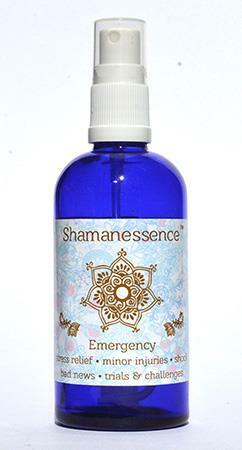 Emergency Trauma Spray for stress relief, minor injuries, trauma/ shock, bad news, tests, trials and challenges. A unique combination of 36 Vibrational frequencies from flowers, plants, Gems & Environmental gases, plus essential oil of Lavender. The rescue type relaxing spray with an extra ooomph! Active Ingredients: Perelandra ETS+, flower essences, gem elixirs, environmental essences: Gotu Kola, Rosa Foetia, Dampiera, Mariposa Lilly, Heather, Beech, Mustard, Vervain, White Chestnut, Koienig Van Daenmark, Rosa Damacenta Versicolor, Combo# 11S tability & Clarity(Opal(Light), Pearl (Light), Tiger's Eye) Combo#30 Emotional Stability(Garnet-Rhodolite, Ruby Star, star Sapphire) Combo#114 Addictive Patterns(Rosa Damascena Bifera, Tahitian Orchid Combo, Penny Royal, Skullcap, Morning Glory, Bo Tree, Woodwardite, Ferberite, Argon, Fomalhaut, Mirfak, Petra) Boleite, Pink Sapphire, Malachite, Magnetite Neg/Pos, Hermiker Diamond, White River Dolphins, Lapiz Lazuli. Shake Well to reactivate the vibrational frequencies, and spray directly in and on area, around auric field, face, etc. Use frequently, allowing gaps in between usage to increase until situation is balanced and stabilized fully. e.g spray once, then again after 2 minutes, then 3 minutes later. If still needed, wait 5 minutes, then as often as intuited. Occasionally a couple of times is sufficient.